Leave those on the shelf and check out Paul Davids' THE LIFE AFTER DEATH PROJECT. This is a bona fide documentary, a sincere albeit loopy defense of ghosts and existence beyond the grave. It aired on SyFy - not exactly the hallmark of quality, I'm sorry, SHARKNADO fans. But the former Sci Fi Channel was an apt venue given that THE LIFE AFTER DEATH PROJECT has a surprise-special guest ghost...Forrest J Ackerman! Yes, `Uncle Forry.' I suppose everyone's got a story about him. I met the great man only briefly, in his old age at one of the first GhoulardiFests. We had a brief conversation about unwieldy movie props; I related to him the true tale of a local lady who had bought an entire Starfleet Shuttlecraft and was having trouble effectively restoring it; Ackerman told me about having a yards-long long model-miniature submarine from some vintage fantasy flick that he had to keep in his yard, because it was too big for the house. Thus it was easily stolen one night, probably for the scrap metal. 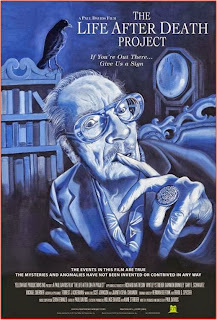 In any case, Ackerman, for those of you saddoes who don't know, was a legendary science-fiction/fantasy buff, editor, publisher, author and memorabilia collector. His illustrious fanzine Famous Monsters of Filmland, with its contests, previews, pictorials and behind-the-scenes on movie fantasy productions old and new, was something like a news-rack film school for generations of young readers, inspiring, among others, Steven Speilberg, Joe Dante and Peter Jackson. Ackerman, alis FJ, alias Effjay, alias Dr. Acula, alias the Ackermonster, was profiled in filmmaker Paul David's 2006 THE SCI FI BOYS. Ackerman died in 2008 (same year as Paul Newman, brrr). Here Davids claims the spirit of this colorful icon of Hollywood horror, science-fiction, fantasy and creature-features (Ackerman, I mean) haunts associates and acquaintances - despite Ackerman's professed atheism and disbelief in an afterlife. Odd electronic malfunctions, misprints and synchronistic coincidences (such as Bela Lugosi's prop Dracula ring, a classic FJ artifact, popping up in the unlikeliest palaces) are, in Davids' interpretation, the playful Forry, communicating in code via his trademark penchant for puns and whimsy. One anomalous ink smudge that suddenly turned up on one of Davids' documents for no reason, undergoes more rigorous analysis than the Shroud of Turin, and there are additional testimonials from folks who claim a grab-bag of ghostly contacts, interventions and other paranormal activity. Still, Davids is game enough to get a token skeptic on camera, who cites a fundamental human need to seek patterns in randomness. Yet even he (assisted by editing, I bet) is persuaded to entertain the notion of something surviving after death, in the manner that immortal souls might exist as some footnote in quantum physics. Thus, he says, "ghosts" may someday be just a late chapter in student physics textbooks. And, thus, be no longer "paranormal." Davids has made documentaries before pushing fringie notions, especially the so-called alien crash at Roswell and the reincarnated gurus of India. He is on a mission to change minds with THE LIFE AFTER DEATH PROJECT, and while I can't say I was entirely persuaded (and I have a well-documented weakness for this stuff, as evidenced by my own series of ghost books), it did make me think uneasily. What if ghosts like Ackerman are trying to communicate with us all the time, with ink blobs and computer crashes (or, in my own case, employment turndown letters and bad relationships), and we are just too distracted or stupid to properly interpret it?